Backpacking? But do you really need a backpack? I am in no doubt that in most cases you don’t need backpack then you are “backpacking”. What is definition of backpacking according wikipedia – “use of public transport as a means of travel, preference of youth hostels to traditional hotels, length of the trip vs. conventional vacations, use of a backpack, an interest in meeting the locals as well as seeing the sights.” Of course there are other descriptions of this term and all of them will include “use of a backpack”, but for me backpacking first of all associates with budget travel. Do I need to have backpack to travel on budget? It is already more then 3 years when I left my home and travel from place to place. I didn’t know for how long I will be on the road, but because I was planning to stay in hostels and other budget places, so first thought in mind was – I will backpacking so I need big backpack for my trip. So I bought MEC Ibex 80 Backpack. It is nice backpack and there are full range of similar backpacks with internal frame. But couple months after beginning of my trip I started to think how many times I needed to use that backpack as BACKpack…The answer was – none. Usually it was short walks to public transport or hostel, or leaving it somewhere at luggage storage. So I realized I didn’t need backpack. One big disadvantage of backpacks – top unloading/loading. I tried to put most often used items on the top, but almost everyday I needed something from the bottom. Although this backpack has access at the bottom, so wasn’t so bad, but at least one repack per day was usual routine. I can live with that, but so called hybrid bags would make life much easier. There are simple bags which can be used as backpacks or one shoulder bags or backpack with wheels. These bags are heavier then usual backpacks, but backpacks has many different straps on outside so you will need such thing as airport tote for you bag protection during loading into plane or on the bus. This will add some additional weight to your total, but it still probably will be lighter then hybrid back (especial one with wheels) and with all weight restrictions on budget airlines it can be issue. Will you go trekking on your trip. If just day trips, may be all you need is daypack? 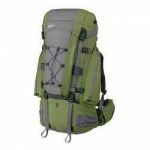 If it will be multi-day trekking, may be you can rent suitable backpack in the place you start your trekking? If you decide go ahead with hybrid bag, check weight and how it feels on you back. Of course it won’t be very comfortable, but good enough for short distances. Do you need bag with wheels? Would be interesting to hear your thought about backpacking gear – what kind and why you are using it. When traveling, it is WISE to never put your name AND address on your suitcase or carry-on luggage. Perps hang out in lines at airports, look at luggage tags, and know you are going away. It is an easy burglary. Just put Name and Phone Number, grab a few extra airline tags, and change it once you are on the ground again. I guess backpacking in the traditional sense is more associated with camping and living in the wilderness, not in hostels, which is basically a cheap hotel and a luggage case would suffice. I’ve used mine a couple of times in treks. However most hostels/guesthouses/hotels have luggage storage so you can just take a small back on treks rather than everything. Maybe it’s actually more of a fashion thing then people (backpackers) care to admit. .-= AdventureRob´s last blog ..AC/DC Live in Sydney =-. For recent trips (including seven weeks in India) I have taken a holdall. Mountain Equipment here in the UK make a range that have strong zips and a long handle that can go over a shoulder. Good article. Many times when traveling round Europe did i curse my big heavy backpack (wasn’t that big or heavy just felt like it!) but it became like a companion to me and if you like to bring things like books when you travel it is useful. I agree with you..hybrid bags really make our life much easier. Despite your instinctual desire to pack only sleeveless shirts, because you know it will be hot and you don’t want to have to wash everything every time you get hit by a wall of 95% humidity, sleeves are essential. When traveling through traditional villages, visiting holy temples or Muslim countries, you’ll want to cover up your shoulders. it is not about sleeveless shirts, but like in Iran you can’t wear shorts nowhere. Even when outside there is +30C.